Spark Circus: the work, the shows. Where do I even begin the story of my circus adventures? The beginning seems so long ago. So I will start at the end. Feb 22, 4 pm. I chucked my bags onto the songtauw heading to the airport. As I plopped myself on the bench and the driver pulled away, my circus family were singing "rum sum sum" to me from the porch of our guest house. This is the song we sang every day as we arrived and left the schools. I sang back to my friends and cried. The circus was well and truly over for me. The previous week had been one of post-circus decompression, staggered departures, and a few reconnections on the road. In pairs and trios, some of the troupe went to Pai, others to Chiang Mai. There were plans to head back to the islands where we started. Some jetted off to Bangkok. Our goodbyes sometimes took place at the front gate of our homebase in Mae Sot, with hugs and waves in the pre-dawn. 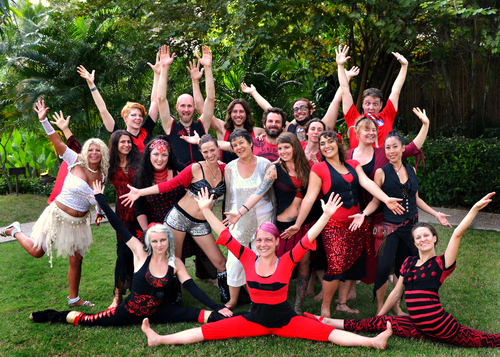 For a month in Bangkok and Mae Sot, our circus family was as tightly knit as you can imagine. And like most troupes rallied around a show, it unravelled when the run was over. There is a core group all from Denver; they will certainly see one another. But will I ever again meet my fellow Sparkles offline? I can't rule it out, but I can't promise I will. I hope so. We bound together so strongly as a group because circus work is hard. It is fun and extremely fulfilling, but at the same time, it is not easy. Our schedule was bursting with shows and workshops. Often it was two a day - a school show with workshops and then a fire show at night. Some days we split into two teams to fit in an extra location. We had a few days on the schedule without shows, and a fair handful of one show days. Some days we travelled far; other days the venues were right around the corner from us. In between shows and on days off, we had myriad tasks to keep everything running smoothly - from taping hoops to arranging water purchases and shopping missions to restock supplies. The crew in charge of shows, workshops, and sound had setlists to plan and lots of communication with everyone. Our personal needs, like laundry, eating, training, and social connections, got slipped in somehow. The pace of life was fast. 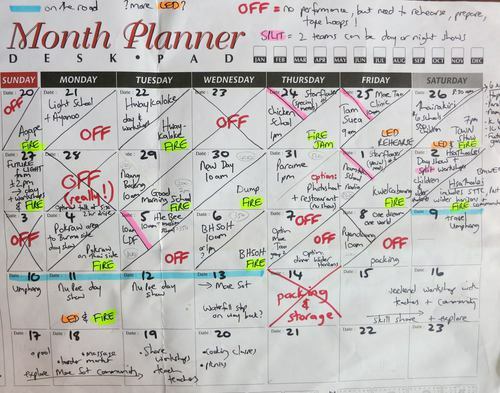 Time management is a key skill in the circus. The hard work, the hours put into so many different tasks, the stress of things not always going as desired...it was all worth it for the reward of smiles and love from kids and communities we visited. Tink at Chicken School. Photo by Lavoz Solidaria. The fun and fulfilment comes with the shows. The energy of the kids in the audience at our day shows fed back in a loop every time. We gave our best, the kids grabbed it, multiplied it, and tossed it back to us. We busted out clowning and silliness, then offered an hour of workshops in hooping, juggling, poi, dance, and other circus skills. After a day show, our ride home was buoyant as we recounted individual encounters with the kids who wanted to hold our hands the whole time, who ran to wash their faces for another round at the facepaint station, or who learned so fast we couldn't teach them enough tricks in the workshops. It is hard, though, to understand that our circus is so outside the usual experience for these kids. Many of the places we visited were boarding schools for children whose parents are still in Burma - they call them IDPs, internally displaced persons. Some of the kids are orphans. Other schools focus on daily education for street kids, or rescuing them from sordid lives of slavery and prostitution. For some of our team, these were heartbreaking realisations. There were tears and quiet contemplation. These children have seen more of the bad side of life than I have, for sure. They live in better circumstances now - fed, clothed, housed and educated. This is a good thing. Hopeful. Despite their challenges and sad histories, kids manage to be happy and childlike when the circus visits. At several schools, we were feasted. I have to say that heaping bowls of rice with soup curry or fruit tasted so good after dancing and playing in the scorching sun. And even better than food, sometimes we were treated to performances by the students - a masked traditional dance, a stunning choreography performed through clapping bamboo poles, modern choreography with traditional singing. Even a Gangnam Style dance one night before our fire show. It was always a huge treat to get a return show from the kids because I truly appreciate the courage and practice that goes into live performance of all types. There was a third act that I did only once in the very last show of the tour. Jew and I planned out a circus-y multihoop extravaganza with a crew of five hoopers but never managed to rehearse it with everyone. We were both eager to play it, so we pared it down to him, me, and Quinn and practiced on the road as we headed into the refugee camps north of Mae Sot. We busted it out in Nu Poe on our very last day and it was fun. I think it will be one of my acts for next year. Our night shows were a complete change of pace from the day shows. We were spinning fire (and occasionally LED) and this was outside my comfort zone, at least at first. I learned a heap about safety, fuelling, extinguishing, and performing with fire. It became comfortable and nearly routine. I truly fell in love with fire performing. Our full fire show began with a group piece based on a Chinese 1000 hands dance. All of us aligned in a column, moving in sync and in sequence to present the fire on our hands in patterns and waves to the audience. It was a very pretty piece. Sometimes I was in this one, sometimes not, depending on my other roles for the show - running sound or acting as safety monitor. Every night's show was a new lineup. We had more acts than time, so the show manager created a new set list every day. Sometimes performers were sick or needed to take time off for whatever reason. Sometimes the shows needed to be longer or shorter or had other constraints. After the set list was developed, the Safety team went into action and prepared a matrix showing who was going to man the various safety stations. We had three people with buckets and towels ranged around the stage to catch any flying props and potentially douse the performers. There were two extinguishing positions with damp towels and duvetene to put out the tool as the acts came off stage. Someone sat with our dipping station to help redip tools and ensure that the fuel was safely contained and kept away from the public. Troupe members switched from performance to safety positions throughout every show. It was sometimes chaotic. Each show concluded with a spectacular of fire as everyone had a turn with their tools, overlapping entrances and exits so that there was an abundance of flame on stage. The climax of the finale was an acrobatic dragon formation made of three people with flames in hands and overhead, battled by April on stilts with a fire sword. There were always lots of grins on stage during that part and happy smiles as we took our bows. Often I missed the bow since I was extinguishing the dragon's tools, but I tried to be quick so I could run up at the very last second and squeeze my way into the line. The acts in between were solo pieces. 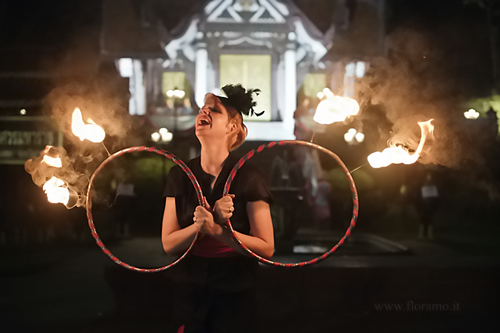 They varied from dynamic to lyrical and used a huge variety of flaming props - hoops, poi, staff, rope dart, fans. All of the performers were highlighted by "framers" who slowly wielded flaming props in the background to add more light and interest to the stage. I loved doing framing to accent other people's acts and everyone had their favorite people to frame them. Nikki and I were often waving isis wings in the background for Jew's poi act, with "palm candle girls" down front. I used fans or torches a couple of times when the regular framers were absent. My favorite framing performance was as a firefly in April's double hoop act. Nothing beats bouncing around using palm candles as lightning bugs. We all fought to get on stage for that act. There is so much more to be written about the circus experience - from the special moments at each school to the personal awakenings I had while in the circus. But this post is long enough and those stories will have to come another day.